The Tower is always a surprise. Just when you think you’ve got it all figured out, something shocking proves you’re wrong. We build towers for defense, protection and a higher perspective. But if we’re not careful, they can easily become prisons. Prisons so high, they become lightening rods. The Tower in the Tarot provides liberation from those elements in our life that have become too solid, unyielding, or concrete. It’s a destructive force, but one that can bring enlightenment along with it. 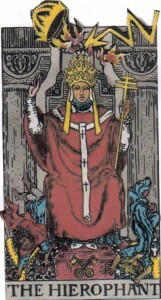 The Hierophant, on the other hand, is much more comfortable when the world feels grounded. He likes things straight ahead, steady and controlled. He is what tradition is all about. He’s the masculine moral authority, and rules are very important to him. He doesn’t typically look well on surprises. But he does appreciate enlightenment. In fact that’s why he’s so concerned with the rules. He uses ritual and tradition to find a path to the divine. 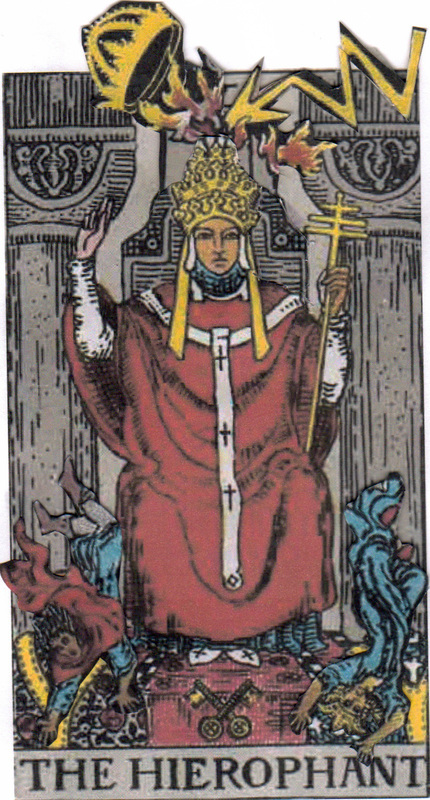 The Tower might come announced to the Hierophant‘s chambers, but the old master won’t likely be too disturbed. He’s more apt to use the situation as a spiritual lesson, like he’d been expecting it all along.